Breast cancer related lymphedema (BCRL) develops as a consequence of surgical treatment and/or radiation therapy in a significant number of breast cancer patients. The etiology of this condition is multifactorial and has not yet been completely elucidated. Risk factors include high body mass index, radical surgical procedures (i.e. mastectomy and axillary lymph node dissection), number of lymph nodes removed and number of metastatic lymph nodes, as well as nodal radiation, and chemotherapy. However, these predisposing factors explain only partially the BCRL occurrence, suggesting the possible involvement of individual determinants. Despite the implementation of conservative approaches, BCRL still remains in a proportion of cases an incurable and progressive condition with major physical and psychological implications. To date, diagnostic methods and staging systems lack uniformity, leading to a possible underestimation of the real incidence of this condition, decreasing early detection and thus the possibility of an effective treatment. Several preventive and therapeutic options are available, both conservative and surgical, but are not included in a standardised intervention protocol, tailored on patient’s specific characteristics. 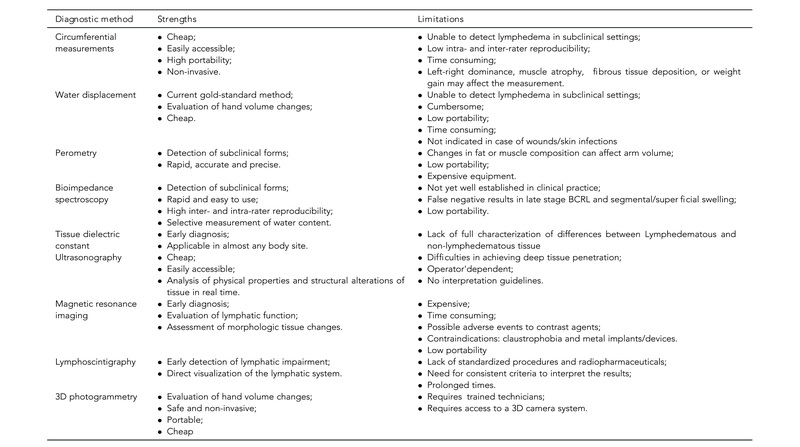 In this review, we provide a comprehensive overview of the current state of-knowledge of BCRL management, novel advantages in the assessment of pre-operative evaluation and risk prediction and discuss strengths and weaknesses of diagnostic and treatment strategies currently accessible in clinical practice.